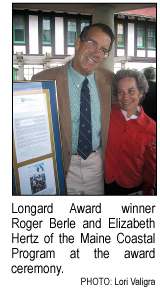 For years as a young lad Roger Berle would heed his mothers request to take out the trash. On Cliff Island that meant dragging the bag from under the kitchen sink and trotting down to the shoreline to toss it in the ocean. Its a story he tells with wry irony. As one of the most energetic and effective proponents of conservation in Maines Casco Bay, Berle said hes been making up for that trash misadventure ever since. In the intervening years, his focus has been as much about preserving island life as it has the natural habitat that makes that life so appealing. That has meant helping bolster Maines island populations, which have dwindled over the decades from a high of 300 year-round island communities 150 years ago to 15 today. Of those, Berle said, 60 percent are struggling to maintain their head count. Cliff Island, where he was raised, is among them. Soaring house prices, shrinking schools and the lure of city jobs work against a revival. But Berle sees it as a test of commitment to quality of life and values. [but since] water is an elemental draw for most of us, particularly in Maine, then were going to work for it, he said. His first official foray into buoying island life was the Cliff Island Corporation for Athletics, Conservation, and Education  a name worthy of Wall Street but better known to locals as ACE. Berle founded ACE in 1977 and built a sense of community and teamwork through weekly ball games. ACEs goal was to bolster that spirit and foster a sense of stewardship for the tiny island, an ethic that included protecting the open land and resources. ACE also brought interns to the school and families to live on the island. Cliff Island faced its own crisis in the 1970s when the island school slipped below the minimum eight pupils required to keep state funding. If the school closed, more residents would leave and the population would sink more. The solution came in the form of a welfare family with six children and an island community willing to pitch in and renovate a home for them that Berle had purchased. That kind of creativity is a hallmark of Berles modus operandi. In a more recent example of his innovativeness, Oceanside Conservation Trust (OCT), the land trust he has served on for 25 years, recently became part of a collaborative with two other trusts to pool resources and focus efforts. The spur for creating Portland North Land Trust Collaborative came in the late 1990s when pressure on island and coastal property from deep-pocketed developers was huge and the offers outrageous, as Berle put it. By contrast, for 15 years OCT had been operating at a glacial pace and wary of financial risk.The collaboratives plan is to respond faster to opportunities. When it comes to conservation, the bottom line for Berle is that youre either going forward or moving back. Theres no standing still.